From my home in Durban, I normally drive via Northern kwa-Zulu Natal through Swaziland and enter the Kruger Park at Crocodile Bridge and then proceed to Tremisana Lodge via Orpen Gate. It is a journey of about 850 km. On my most recent trip (end of June) I was very concerned to see the effect of the drought that we are presently experiencing. Parts of the Pongola Game Reserve look like a desert while the Black Umfolozi River which feeds the Lake St Lucia ecosystem has been directed to flow in a man-made furrow. The sugar cane farmers all face extremely tough times and the animals of game reserves such as Hluhluwe-Imfolozi and Mkuze are in for a difficult season. In Kruger Park, the drought has resulted in the drying up of some dams. The Kumana Dam between Tshokwane and Satara is bone dry. I have always enjoyed the game-viewing around Nsemane Dam between Orpen and Satara and our game viewing reports by our guides over many years constantly describe the excellent game viewing had here. I remember when this dam was built in the mid-Seventies and it has always had water. Unless we have some heavy unseasonal rain, I am pretty sure that Nsemane Dam will, for the very first time, dry out this year. I took the photo below that shows the struggling hippo pod. We have also had drought-related problems at Tremisana Lodge. As you know, the Tremisana Dam, just south of the Lodge, is fed by water from a solar-panelled borehole. This dam attracts numerous animals as it is the only water source in a radius of 6 km. The gardens at Tremisana are one of its most valued assets and we water these gardens via an elaborate spray system. The end result is that Tremisana Lodge is a green oasis surrounded by the brown and dusty surrounding bush. This fact has not gone unnoticed by the animals. We have had various antelope enter the camp and recently have had elephants twice break through the electric fence to savour our juicy Strelizias. We generally do not activate the fence during the day and with the Eskom load-shedding problem at night, we had to re-consider the situation. We have decided to operate the fence via a battery (so ESKOM load-shedding doesn’t matter) and we shall have to inform all staff and guests that the fence will be activated on a 24h basis. This will continue until after we have some decent rains which hopefully will fall by October. The month of June was very interesting as we really enjoyed helping our local community. We visited Funjwa Primary School and the Catholic Church in Acornhoek. All the guests were very happy to socialise with the locals. The thing that makes me very happy is that both groups that visit us every year keep on doing an excellent job. The first group to visit us was Mitty High School from the USA from the state of California. The group comprised of seventeen girls, twelve boys and five teachers. They prefer to help the Catholic schools in the area. We left the lodge early in the morning travelling to Acornhoek village accompanied by one of the Viva Safaris management, Mr Trevor Zeegers. Everyone worked very hard and was willing to help in any way possible. We were divided into five groups using the big five names. 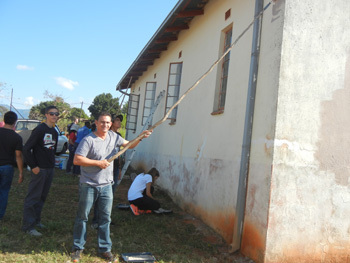 Most of the students were painting walls and the rest were cleaning the walls before painting. When we finished the building was completely transformed. After all the hard work we played a soccer match with the locals. The second group was Long Beach University. There were nine students – one boy and eight girls and Professor Pamela or Nduna. She has visited Viva Safaris for ten years and she likes to travel with me as her guide. They prefer to help Funjwa Primary School – to teach them how to write and read. They donated some stationery, bought food for the kids as well as some school uniforms. Our presence was highly appreciated and everyone was very happy. The next day we went to Kruger National Park. Our first sighting was of a big herd of elephants drinking water and taking a bath at Nsemani Dam. At Ratelpan bird hide we spotted a leopard walking along the road calling continuously. Impalas saw the leopard and all started making alarm calls and ran away. Along the S127 towards Satara there was a lot of general game including zebras and giraffes. After lunch we received information about a zebra kill along the S39. We did not waste any time – we went straight to the sighting and when we arrived we found the carcass on the road and the lions were busy feeding. There were six lions in total – two males and four females. The students loved the sighting and were very appreciative! The month of June has been very dry with no rainfall. We have had excellent sightings of wildlife in Balule. 6 male elephants were seen at Camp Fire dam. 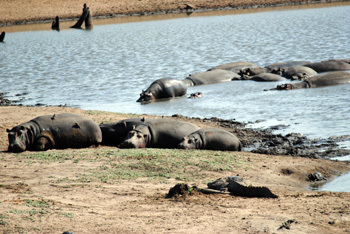 Hippos and crocodiles were spotted on the river banks of Olifants River as the water levels are very low at this time of year. Although these are common sightings on our bushwalks, the guests are always thrilled to see any animals in their natural habitat. An interesting and rare sighting of a male black Rhino, as black Rhino are an endangered species due to poaching. On the sunset game drive, we were very lucky to spot a passing herd of male elephants near Barnard dam. We have had a large number of elephant sightings this month as they search for water to drink in our ‘thirsty land.’ Another one of Africa’s big five, a bull buffalo was seen passing by Barnard Ngwenya dam. What an awesome start to the safari for my guests. Just after the guests had enjoyed a traditional South African bush braai at our candle-lit Marula Boma, a Civet was spotted nibbling on the leftovers from dinner. On the way back from the sunset drive we were pleasantly surprised by the sight of a pride of lions with cubs. On Marula road a young male leopard was seen with great excitement from both me and the guests. It was a great end to a beautiful and unforgettable game drive. Large Buffalo herd near Tremisana Dam. Winter is the best time to view animals. It’s so much easier to view animals because the bush is less dense. We had some amazing sightings of lions and elephants that came up so close you get nervous when seeing their true size compared with the vehicle. This month was my first time ever to get charged by 10 elephants all at once. A big breeding herd came across the road just before the Timbavati road in Kruger. We were driving on the S127 and stopped on a hill where about 80 elephants wanted to cross the road. We waited patiently until they had all cleared the road. As soon as I started the engine they all looked at the vehicle and made that ‘grumbling tummy’ noise. This is when I knew we had to move, and when I drove off they all came charging, trumpeting in our direction. Eventually they stopped and we all were so rattled. The sounds they made were very scary. It’s not every day when you get charged or get your heart beat rising. Some days are peaceful where you see massive breeding herds of giraffes, impala and zebras and kudus, just browsing and grazing with so many ox-peckers on each of them, it’s almost impossible to count them all. 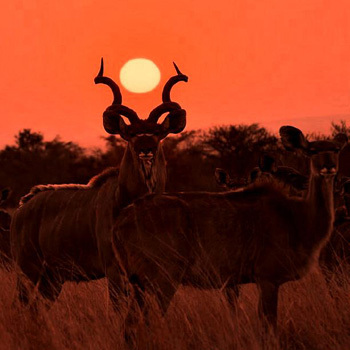 Outstanding photo of kudu at Sunset. This month I can also say proudly I’ve seen four of the “Secret Seven” in just 2 days. For those who do not know what the “Secret Seven” is, I will explain. You must have heard about the “Big 5”, “Ugly 5”and the “Small 5”. The “Secret Seven” are the most difficult animals to spot/find on a game drive: Porcupine, Genet, Civet, Aardvark, Serval, Honey Badger and Pangolin. I still need to find Aardvark, Serval and a Pangolin to complete my list. Fingers crossed. The best sightings I think are when we get to see maybe two or three of the “Big 5” in one picture. Or when there’s seven different animal species around a waterhole. Kruger Park has so much of that. That’s what I like about Kruger. Your chances of enjoying sightings like this is almost guaranteed. Lions and elephants in one snap shot. Hippos, impala, giraffes, warthogs, gnu’s, crocodiles and zebras all in one picture if you get to Nsemane dam on your way to Satara. This is what makes Viva Safaris such a great company. The month of June was packed with several special sightings. I enjoyed viewing members of the big five in both the Olifants West private reserve and the Kruger national park. The dry conditions in the reserve have caused whatever little water still remains to become a hot spot for wildlife activity. When one examines their surroundings a little closer it’s amazing what one can spot – it was on one of these occasions that my guests and I got a little more lion than we bargained for. We had left Satara, our lunch stop, still hungry for some lions. The morning session had provided us with some excellent elephant sightings, as well as a large herd of buffalo. I had headed off in hope of finding some action as the afternoon cooled down – it didn’t take long before we had spotted several large elephant bulls, standing like statues under the trees. The next thing we spotted was a rhino, moving a little way of from the road, enjoying the somewhat cooler afternoon air. But still the lions remained elusive. I kept on going looking high and low for any sign of lion activity, and managed to spot a small bachelor herd of elephants, moving alongside the road, heading towards a small watering hole. We stopped to watch these massive creatures sucking up water and tossing it on their backs, cooling down. I had begun to scan the area – on the far side we could see some ostriches moving across the plains, as well as a scattered herd of zebra. It was when I looked on the opposite side of the road that we got excited – it was the tawny colour of lions lying in the shade about two hundred metres from the road. An increase in excitement levels and a feeling of relief was evident in the vehicle, although they were far away, it was still lions. We sat watching as they rolled around, feet in the air, they seemed to be waking up, much to our excitement. The lioness then stood up and started walking away from the shade, straight towards our vehicle – we couldn’t believe our eyes. It wasn’t only one lioness but four, followed by two adolescent males. They walked up to us and then stood gazing into the distance, at those zebra we had spotted earlier. We spent a good hour sitting watching these lions right next to our open vehicle – it was quite incredible. The beauty of leopards is the fact that most sightings are completely unexpected and my most recent and very memorable leopard sighting did not break this rule. It was getting late in the afternoon and it was time to head for the gate. The Kruger however was not finished with us, and still had a sighting up its sleeve. It was while driving along the very dry Timbavati River that I spotted something that didn’t quite look like a branch. I stopped the vehicle to have a closer inspection – and there it was – a big male leopard resting in the tree. We sat and watched as it began to move around a little more. Eventually it decided it had had enough of all these onlookers and climbed down from the tree and then headed across the road just in front of us and into the long grass. Cheetahs are one of our more timid large cats and not often seen from up close. It was in the Kruger that my guests and I got to experience one of these beautiful creatures up close and personal. We had literally just driven through the gate of Kruger – the day was still young. A cheetah sighting wasn’t really what my guests expected. From a distance I noticed a vehicle parked next to the road, peering into the distance. 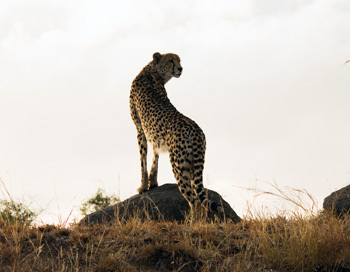 We drew closer to investigate and there next to the road was a female cheetah, posing beautifully in the soft early morning light. She looked hungry and definitely on a mission, as she walked across the road in front of us peering into the distance. We had plenty opportunities to take some beautiful pictures of her, before she disappeared into the bush in search of food. 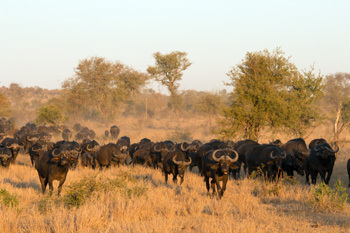 The most spectacular sighting, mainly due to the scale of it, involved a herd of buffalo. The day was drawing to an end, and it was time for the buffalo to head for the water. My guests and I were fortunate to find ourselves between the water and the buffalo – we sat and watched the dust fill the air and the buffalo creep closer and closer. Eventually we had approximately five hundred buffalo staring directly at us, politely asking us to please move and so we eventually did. It was an amazing experience and a great way to end another brilliant Viva afternoon. The month of June has been very good as expected because the vegetation is no longer thick and we tend to concentrate on water points which constantly invite so much general game that in turn attract the big cats. We’ve had so many good sightings at Nsemani Dam and Girivana waterhole and moving to the south at Kumana Dam, which unfortunately is now dry. Early this month we were driving along the S 39 – the long Timbavati road. We were mainly looking for leopard as this road is one of the better ones to produce leopards, when we suddenly saw a pride of lions sleeping in the river. They looked unsettled as they kept on standing up and look around. It was a pride of 11 with two cubs. The next day when we went to Satara for lunch and checked the sightings board for updates, the S 39 was marked with lions and leopard again. My guests asked me to drive there to see if we might see some cats. 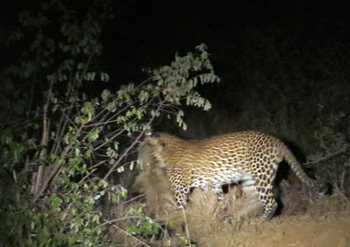 As we approached one of the water points, one of my guests shouted “leopard” – it was a male leopard. He was shy and went behind the Sycamore tree to hide. We waited there patiently until it came out of the tree and started moving off along the river. On the 26th we found a male cheetah sitting on a termite mound as we entered Orpen. It was almost as if it was waiting to welcome us as we entered – we found it just 50 metres away from the gate, very close to the road. We started the Sunset game drive very well with elephants along Marula road. We were making our way to the Olifants River as we had been told by the Viva guide who took the afternoon drive about a cheetah sighting next to the river feeding on an impala carcass. Before we even reached the Cheetah sighting, we found a leopard stalking a sounder of warthogs that were trying to run away from the den that they were in. They were struggling to move out as these are diurnal‎ animals. The leopard was lying next to the hole about a metre away and looking at the warthog who seemed to scent the danger but couldn’t pick out where it was coming from because that skilled leopard was very flat on the ground. As they all try to sneak out, only the first few ones manage to get away. The last one was caught by the throat. It was making so much noise at first – I think some of the younger guests felt sorry for the warthog – and we waited patiently – as the leopard took about 10min to move and it came across the road right in front of my and Bongani’s Landcruisers. It sat next to the road in the bushes and enjoyed its supper. Our one guest took a video which is now posted on Viva Safaris Facebook page. We started making our way to Marula Boma for our supper and we came across a Black Rhino along the way. The month of June has been a very cold month for me. Anything below twenty degrees sees me rushing for my fur boots. Everyone is very happy when the sun comes out and gives us the extra chance to sit in its comforting warmth by the pool. I really prefer wandering in the gardens around the lodge. We love the dinners at the Boma with the warm fireplace. Lots of hot chocolate and coffee!! This is becoming a great ritual as the winter nights get colder. I realised that I had not been at the Boma for quite some time and decided to go on the Sunset game drive. The sun sets as the drive begins and the sparkle of the stars at night while having dinner at Marula Boma always make me marvel. There is no other place in the city quite like this place. My love for elephants almost came to an abrupt end this month but anyway, who am I kidding ? I still love them. Just as we finished lunch one of the guides came and informed me that there was an elephant IN THE CAMP close to one of the chalets. I thought he was pulling my leg. 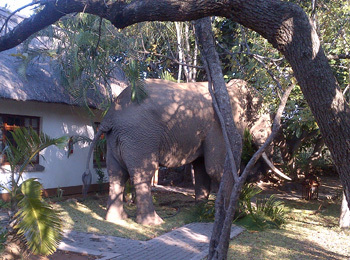 I went outside and there he was – a big male elephant we call Soshangane busy minding his own business and eating away. 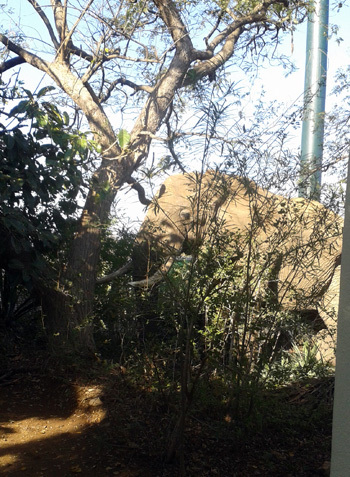 Elephant in camp – testing Nyarai’s nerves ! I was so excited and also a bit scared. My mind was racing how we will get him out. What if he takes a dip in the pool? What if he decides he will stay here for a while? We all gathered up quickly and had pots and pan and a drum. The one we usually sound for dinner. One would have thought we were having one of those little traditional gatherings celebrating winter. My heart almost came to a stop when he mock charged us. I was in front. I ran for dear life. It took me a couple of seconds to start laughing yet at the same time I was fighting back tears. Eventually we managed to get the big guy to go out. Whoever said winter was boring should could come down to Tremisana and experience the exciting times we have down here. I so look forward to the month of July. I know it can only get better. It is with the greatest regret that I inform you of the passing of our beloved Ronald Masango, Camp Manager at Marc’s Treehouse Lodge. Ronald was involved in a head-on car crash on the 18th June, just a few km from his home. Ronald was a corner-stone of the Lodges and was a great asset to Viva Safaris. He will be sorely missed. I initially employed Ronald in 1997 as a carpenter to help with the building of the Guest House at Tremisana Lodge. The following year Viva Safaris bought Marc’s Treehouse Lodge and Ronald was transferred there to assist in maintenance of the existing treehouses as well as building new treehouses. His work will be an eternal reminder to all of us of this wonderful and talented man. Over time, Ronald showed impressive skills both in leadership and in handling staff and he was promoted to Camp Manager in 2007. He was the very first black Camp Manager of any private game lodge in this region. The large number of mourners at Ronald’s funeral indicated how popular and respected he was. We shall miss him. RIP. I have sent out the 2016 tariffs as promised. If you have not received these, please let me know. As always the tariffs will be valid for the entire year i.e. from 1 January 2016 to 31 December 2016. We have increased the tariffs minimally (for some safari packages not at all) and I am confident that our products continue to be the very best value-for-money safaris to Kruger Park. I have included rates for safaris that will be using our new 4 star Tented Chalet camp. It is still being built and we shall send you photos of the completed product hopefully by the end of November. The chalets will comprise canvas sides and thatch roofs. Each chalet will have its own splash pool, indoor and outdoor shower and will have a distinct bush theme with liberal use of rocks and tree branches. Thanks also to Andrew MacDonald, our intern from Campfire Academy, for setting up the TrapCam that keeps us updated on the numerous animals that drink at the Tremisana waterhole. These images can be seen on the associated Tremisana Facebook site. Marc’s Treehouse Lodge is as unique as the name indicates. The folks there are incredibly friendly, making me feel like family from the moment I arrived until the moment of departure. I loved being out in nature, having to walk through a bit of bush to get to my peaceful river-front bungalow, being surrounded by nayala each morning and the baboons discussing their daily pecking order. The monkey’s enjoyed breakfast with us most mornings as we enjoyed the lovely lakeside boma. The staff was exceptional, especially the manager. I will say though, one of their guides was less than enthusiastic about showing visitors the wilds of Africa. It was as if this was just a job for him and couldn’t be bothered hanging out for any period of time with animals that didn’t top the “Big 5” list. We did have a bush walk with a good guide though and visited a private reserved with a guide who truly loved his job showing and teaching visitors about all the amazing flora and fauna of South Africa. I stayed at a 5-star place later in this trip, but would recommend Marc’s Treehouse Lodge far and away over the snooty private place. We (myself & my spouse) stayed here for 3 nights last Month in a tour program put together by Viva Safaris that covered an interesting mix of activity…..we had a great stay with 3 varied types of lodging exposed to us…to keep us guessing…..fantastic food, great friendly people/staff……quite personalized & caring/genuinely concerned employees about the guests’ requirements…..we liked the fact that we had Luke the ranger to work with. Great positive attitude genuinely helpful respectful asset to Viva safaris….with great knowledge of the bush…….we were very lucky in terms of sightings of prey & predators in our 6 day tour with Viva…….the program included game drives in Balule itself, 2 full day drives into greater kruger, visits to Moholoholo rehab centre which is great with cheetah interaction & close up views, vulture interaction etc, 2 visits to Tshukudu which was absolutely great with again super cheetah interaction opportunities. Oh the 1st night Sunset drive & the bush brai was a truly great experience………we ended up with almost 3 night drives eventually……. all in all the team the system/process put in place for operations by Trevor is great…..seamless flow of activity…..great job viva & Piero hats off to you..thank you so much…memorable dream come true for us in south africa & kruger. My family (parents and 2 kids) had an incredible stay at the lodge. 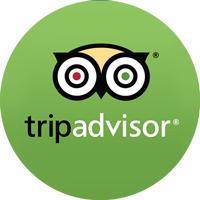 The staff was friendly and the food was great. Everyone was extremely hospitable in every way imaginable. Even one day when we were going to Kruger and it was raining, they gave all of us heavy wool blankets and me a poncho since I didn’t have one. The lodge is more rustic but everything was clean. All beds had mosquito nets but in April we didn’t need them. We booked via Viva Safaris and the itinerary we decided upon was great. We hit Kruger, a private reserve, a closed border private reserve, and the Moholoholo animal rehabilitation center.